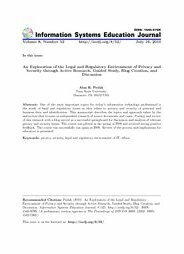 Abstract: One of the most important topics for today’s information technology professional is the study of legal and regulatory issues as they relate to privacy and security of personal and business data and identification. This manuscript describes the topics and approach taken by the instructors that focuses on independent research of source documents and cases. Posting and review of this research with a blog served as a successful springboard for discussion and analysis of relevant privacy and security issues. The course was piloted in the spring of 2008 and received strong positive feedback. The course was successfully run again in 2009. Review of the process and implications for educators is presented.